Mining, demolition and recycling present work environments with a high occurrence of all kinds of dust. Our fully automated dust binding systems V12 and V12S are powerful, environmentally friendly solutions fit for use in any work environment. Patented nozzles generate a very fine, atomized water mist, thus effectively binding dust particles directly at their source. 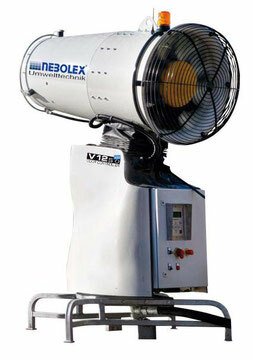 State-of-the-art nozzle technology guarantees efficient use of water. Easy controlling via radio remote, touch panel or desktop pc. The turbine in the V12S has two different speed settings and is capable of launching atomized water mist in a range of anywhere between 10 metres and up to 50 metres while maintaining a low noise level, so it is even suitable for use in urban settlement areas, e.g. on construction/demolition sites etc. 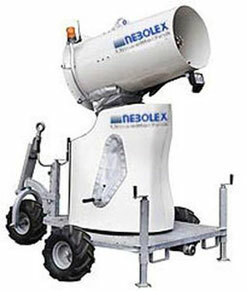 Low-noise demolition in urban areas? - No problem!